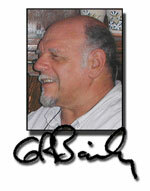 hroughout his life, George Roger Bailey surrounded himself with music. By the late 1950s, he had narrowed that focus to the guitar. When he started his university career at Stanford in the late 1950s, he already had discovered the most altruistic application of this fascinating instrument  wooing girls with sweetly strummed love songs in the woods of Mt. Tamalpais State Park in nearby Mill Valley. A fateful stint in Spain in 1964-65 exposed Roger to the Flamenco style, and for a year he was enthralled, playing night and day, intoxicated by the heady draughts of his surroundings: the history of the Spanish landscape, the passion of the Flamenco  and the fumes from the wine vats he and Charlotte were living over as guests of a vineyard owner. Upon returning to the U.S. in 1965, Roger began serious study of the classical guitar, and in 1980 purchased the Hirade used in the Scholarship program. It was during the mid-1980s that he and Charlotte had begun seriously combing the area around their Kern County home for classical guitar performances, the most reliable being far south at CSU Northridge. It was there that Roger encountered members of the fledgling LAGQ and convinced them that a tiny theater at Bakersfield Community College would be an ideal practice venue and that they should check it out. Many classical afficianados are still scratching their heads over how he pulled this off. Family and the myriad responsibilities of life forced Roger’s guitar interest onto a back burner for most of the 1990s and early in the millennium, until his retirement brought it to the foreground once again. His ambitions, however, were cut short by his untimely death from pancreatic cancer just after his 65th birthday in 2004. The G.Roger Bailey Classical Guitar Scholarship started as a simple memorial concert Charlotte organized in September 2005 to mark what would have been Roger’s 66th birthday. The performance was so memorable that the lasting impression it left became the impetus for the scholarship. 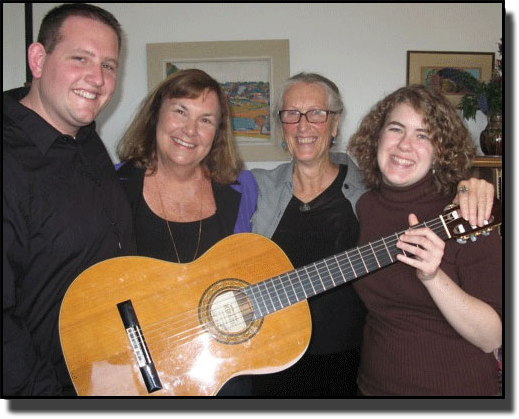 Annual benefits by some of the most talented classical guitarists of today now generate funds to instill in students the joy for classical guitar that Roger and Charlotte have themselves experienced. 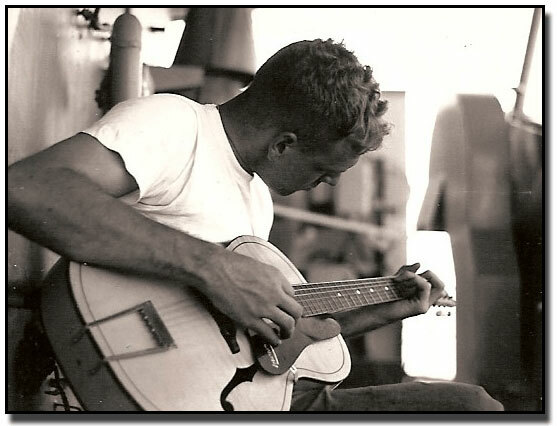 ROGER PLAYS A LATE 1950S-ERA STELLA GUITAR ABOARD THE U.S.S. TWINING IN 1961. IN 1980 BY G.ROGER BAILEY AND NOW USED IN THE SCHOLARSHIP PROGRAM.